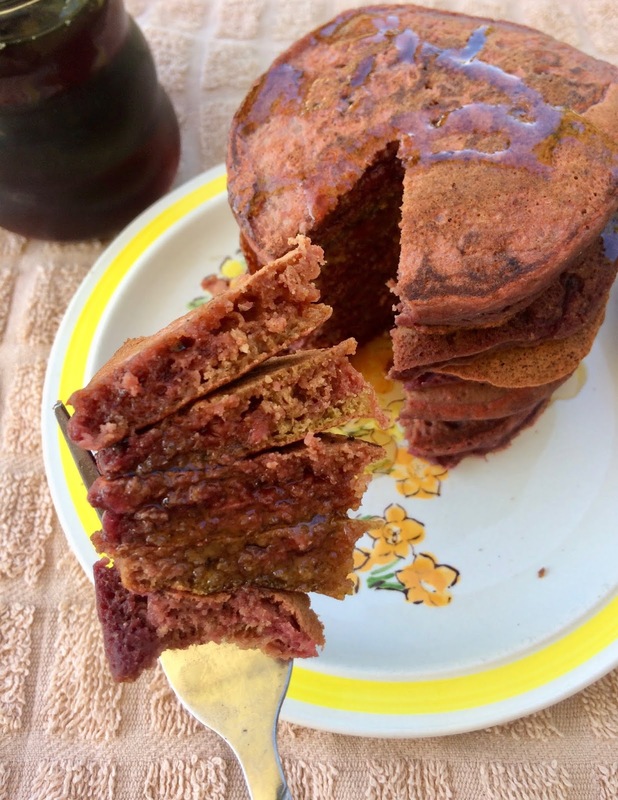 Sweet, earthy beets are used to add color, flavor, and sweetness to these pancakes made with whole wheat. 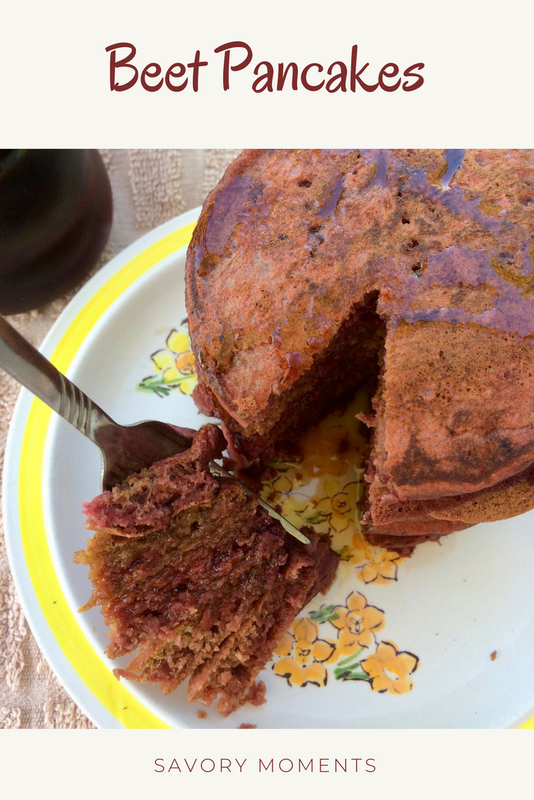 Long-time readers and friends know I have a bit of a pancake obsession and I've shared quite a lot of pancake recipes over the years - in fact this is my third so far just this year. I keep thinking I'm going to run out of ideas, but it hasn't happened yet! I've been kinda into beets lately, especially after making this amazing beet lemonade, so I figured it was time to make some beet pancakes. As a mom of twin toddlers, I'm always sneaking vegetables into foods and pancakes are a really easy way to do it. 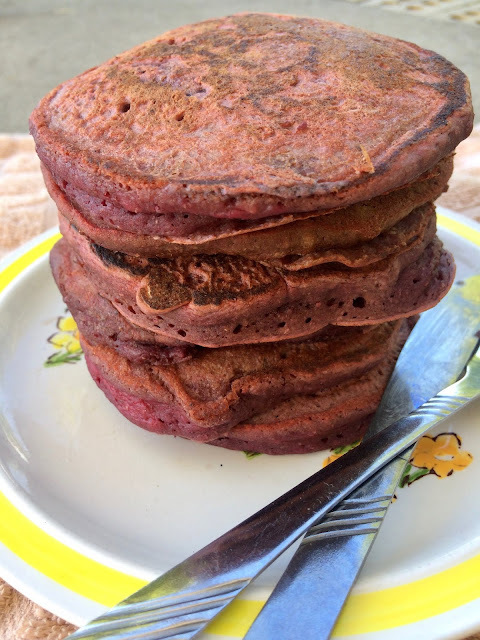 The beets turn these pancakes a really lovely shade of pinkish and they taste delicious. The kids enjoyed them (as they do all pancakes) and my husband and I did as well. This recipe will serve about four people. In a medium bowl whisk together the flour through cinnamon. In a large bowl, whisk together the buttermilk through beet puree until well-combined. Use a wooden spoon or rubber spatula to stir the dry ingredients into the wet until just combined. Heat a large griddle pan or cast iron skillet over medium heat. Grease with butter or olive oil and cook the pancakes about 1/4 cup of batter per pancake. When they turn golden and begin to bubble, flip and cook until the other side is golden. Repeat until all batter is used. Serve hot topped with real maple syrup, butter, or yogurt. *If you don't have buttermilk, simply put one tablespoon of lemon juice into a one cup measuring cup and fill the rest with milk. Let sit for 5 minutes. **Peel and steam or boil your beets and then puree in a food processor with as much cooking water as needed to make a smooth puree. If you have extra beet puree, make these muffins. Very tender and fluffy! These pancakes are definitely a keeper. Wow these sound so interesting! I love beets so these are definitely worth a try! These sound and look lovely! Definitely a great way to sneak some extra vegetables into my son’s diet! These do look like really yummy pancakes. I would't have thought about adding beets to them. Now these sounds absolutely delicious! Love the color too!! !